by David J. Silva, Ph.D. Follow co-workers Ms. Kim and Mr. Park as they discuss their families and daily life. Watch video and learn about greetings, shopping, food, dining out, weather, education, literature, holiday traditions, and more. With our specially designed video player for language learning you can pause the video at any point and scroll the transcription. Read annotations about culture and grammar. Click on almost any word or sentence to hear it spoken, along with translations. This course can be used either by independent learners or by students in a traditional or self-instructional classroom setting, and is the equivalent of the material covered in a one-year college course. 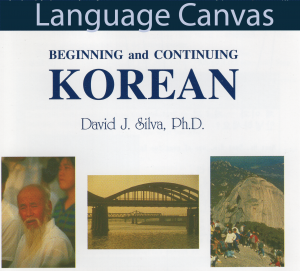 Beginning and Continuing Korean was developed and peer-reviewed by Korean language experts, and used by college students as their textbook. The entire course contains 20 lessons, 45 videos performed by native speakers, hundreds of annotations, and 7,500 audio clips. Beginning and Continuing Korean was originally published as part of the highly reviewed University of Arizona Critical Languages Series. We have added many new mobile-friendly features that help you learn Korean on desktops, tablets, and smartphones. You will need to install a Korean keyboard on your device to enter Korean text in some exercises. Multiple Choice, Fill in the blank, and Listening Dictation exercises are provided for each lesson. A searchable audio glossary with thousands of words and translations helps you find every occurrence of a word or part of a word in all of the lessons. 과음 （過飮）- Too Much to Drink! Dr. David James Silva received a bachelor’s degree in Linguistics with Psychology and Social Relations from Harvard University in 1986, and a Ph.D. in linguistics from Cornell University in 1992. During his tenure at Cornell, he was awarded a Fulbright Fellowship for study and research in Seoul, Korea (1989-90). From 1991-1996, he served as a Korean language program consultant and examiner for several colleges in the New England/New York area. He is currently Provost & Academic VP at Salem State University. Additional information can be found here. Beginning and Continuing Korean materials © 1995-2019 Arizona Board Of Regents on behalf of the University Of Arizona. Used under license.